Training is an investment. We argue that to maximize the return on that investment, training needs to stick. The longer your miners remember what you’ve taught them, the more profitable your investment. The picture above is taken from one of our trainings. The attendees are applying a technique, in a training seminar, that helps fuel creativity and concentration when brainstorming. Through practicing the technique the attendees will be more likely to remember the learning. Mining training occurs so that employees are equipped with essential knowledge that will allow them to do their jobs more efficiently and safely. Training is an investment. We argue that to maximize the return on that investment, training needs to stick. The longer your miners remember what you’ve taught them, the more profitable your investment. This article is focused on training for knowledge retention in the mining industry. We will look at the problem of ineffective training currently facing many mining outfits and the solutions needed to improve training and increase retention. You might be wondering why there are pictures of marshmallows, spaghetti, masking tape and string above this paragraph. The reason is that these items are used in a training activity that teaches teamwork, communication, strategy and problem solving. Teams have to build a freestanding tower using only these materials, with a marshmallow placed at the top. By exploring training techniques outside of the traditional use of Power Point slides you can increase retention while truly developing people’s skills and knowledge. Employee training rarely sticks in our mind like memories of a favourite family trip to Disney World, or even the plot line of a good movie that stays with us for long after it is over. 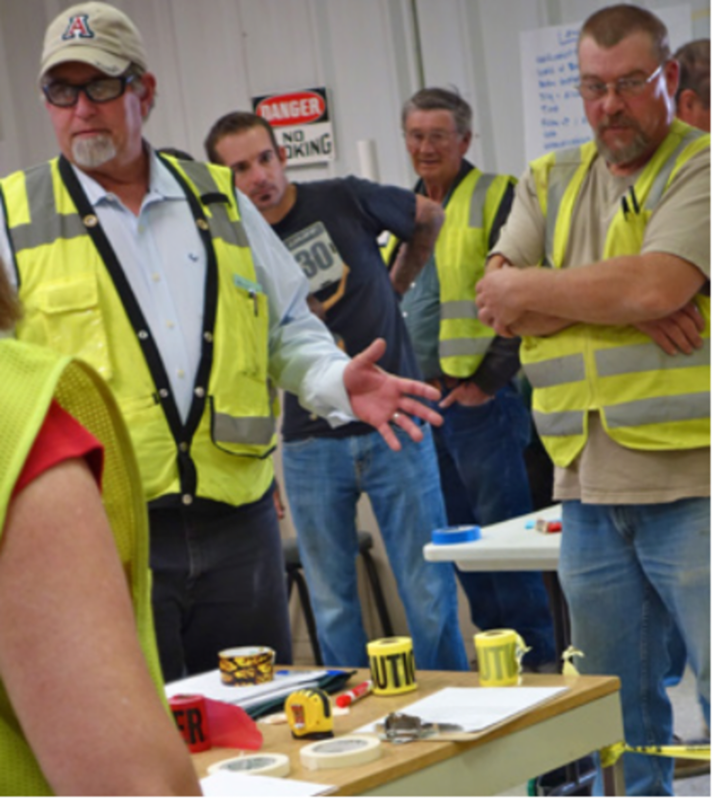 In mining education, we are usually training our employees so they can walk away with new knowledge that helps them perform their jobs better and more safely. This is important stuff to remember and yet it often doesn’t have a lasting impact! Naturally, the longer the educated miners are able to hold on to this knowledge the better the return on the training investment. Yet very few mine sites are maximizing their training potential by educating for knowledge retention. What does this mean in a hard numbers sense? In the world of corporate training $156 billion was spent on employee learning in the US in 2011 based on data from the American Society for Training and Development. Yet the payoff on this investment was slim without the proper teaching techniques. Up to 90% of skills learned in employee education initiatives were lost within a year of being taught. 1It doesn’t have to be that way. You don’t have to fall victim to a system that encourages you to spend training money on short-term knowledge acquisition. You can make your training investments have long- term returns. You just need to have training that is designed to stay with students for a long time. Knowledge retention is not a mysterious art. There is hard scientific evidence about teaching practices that boost long-term retention. This research has been conducted in the fields of psychology, neuroscience, and education among others. So what does the research say about teaching for retention? Practice Retrieval of Information: Getting students to find the answers several times makes it more likely that they will be able to find the answer in the future. Use a Variety of Teaching Techniques: Teaching a concept in several different ways, may make learning more challenging for students, but it also makes learning stick. Translate a Concept from One Format to Another: Learning is enhanced when learners must take information presented in one format (audial, visual, kinesthetic) and re-represent it in an alternative format. Build upon Foundational Knowledge: You must take into account what your students already know and build upon it. What is learned depends heavily on prior knowledge and experience. Set the Stage for Learning: What your students think about learning matters. You must introduce your educational initiative in such a way as to get students on board and in agreement with what they are doing and why they are doing it. Learning by Doing: What learners do in their learning sessions determines what and how much is learned, and how well it will be remembered. Problem Based Learning: When students get to work through a problem to find its solution, they will retain more of what they learned. What these solutions look like in practice is largely up to the instructional designer. We here at Meyvn keep up to date on the latest adult learning theory, and learning retention research. 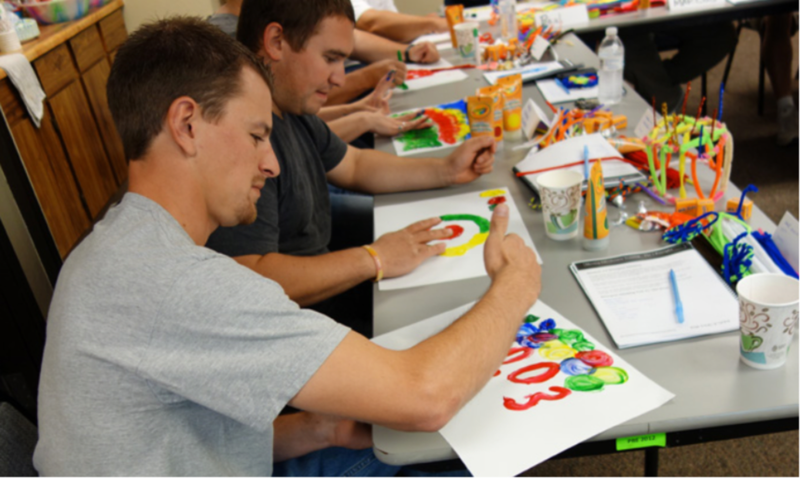 At Meyvn we implement these practices that encourage long-term learning retention in a way that is fun for students. We seek “aha” moments that will wake students from their normal classroom boredom. We break up our learning into manageable mod- ules and make sure to include activities that require movement and interaction so students are never sitting and listening for long periods of time. 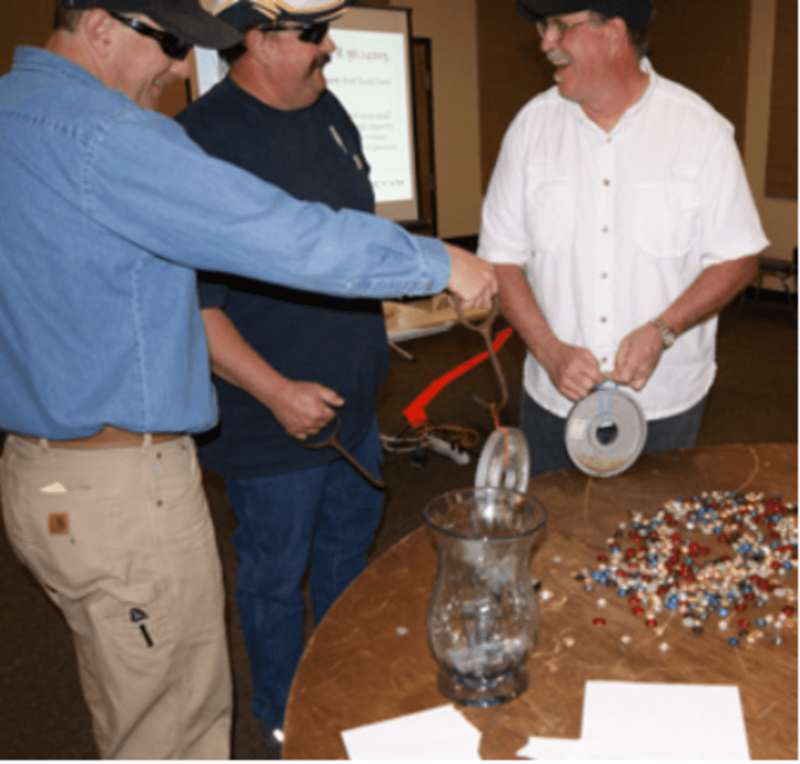 What have we learned about teaching for retention with mining employees? Practicing Retrieval of Information may sound yawn inducing. Who wants to do the same thing over and over again? Retrieving information multiple times is essential for setting up a memory trace but sometimes it isn’t fun to teach or learn by repetition. We find that by Practicing Retrieval of Information and simultaneously Using a Variety of Teaching Techniques, we can make our classes a little more interesting. For instance we will ask students to recall what their pre op inspection policy currently looks like. We will then ask them to write out the policy, as they understand it. We will discuss pre op inspections with them, and then we will have them practice using pre op inspection skills on broken bikes, that need to have several things fixed before they are safely usable. Having Students Translate a Concept From One Format to Another was an intuitive concept for us before it was a scientifically proven one.To have students transfer information from audial to visual, or from written to acted out ensures that they fully comprehend the information at hand. One such instance of this in our training sessions is when we have people discuss leadership styles. They talk about their values in leading, and how they use their personalities to achieve a leadership style that works for them. We then have them draw a leadership shield. They draw representations of what maters to them in leadership. We have our students take information that has been spoken and make a visual representation of the same information; in this way we help the ideas stick in the students minds. Building on Foundational Knowledge is something we strive to keep in mind throughout our training workshops. We don’t ever want to speak down to our students, and assume they know less than they do. At the same time we can’t assume that the knowledge they have amassed over the years is totally correct. One way we tap into our students previous knowledge is by asking them to set up barricades for an explosion. Most of the students have been exposed to a barricading situation before. We simulate an explosion using Mentos and Diet Pepsi. Pepsi bursts forth from the bottle and distributes spray in an area that is hopefully no larger than the area barricaded. We see how much of the barricading they get right, and what parts of what they remember might be incorrect. We look for bad habits in using foundational knowledge and make sure to correct for mistakes that have become habits over time. In this way our students know that we respect what they have learned previously but we are also conscientious of bad habits. Set the Stage for Learning is taken care of at the beginning of any workshop we put on. We ask our students to suspend their disbelief that fun can be educational, and that active participation can be an integral part of the learning process.Because we use unconventional techniques to teach, we need to make sure our students are open to the idea of learning in unconventional ways. We are giving them useable knowledge in the form of enjoyable activities with connections to the real world. We talk to our students about some of their hang-ups when it comes to training. One of the ways we get them attuned to our teaching philosophy is by setting up their desks before they come in the room. On their desk they find pipe cleaners to keep their hands busy, candy in case they get hungry and a variety of coloring utensils for their learning needs. Students Learn by Doing is a favourite of ours. We love experiential learning. It encourages the application of learning after the course is over since students have experience with actually practicing what we are encouraging them to do. One of our learning by doing activities is having students walk through an obstacle course with a golf ball on top of a marker. We are teaching them to limit their operating speeds to maximise their control. The goal is to get through the obstacle course as quickly as possible without dropping the ball (losing control of the equipment) and that requires students to go at a speed conducive to success. Students Who Engage in Problem Based Learning love educational problem solving. 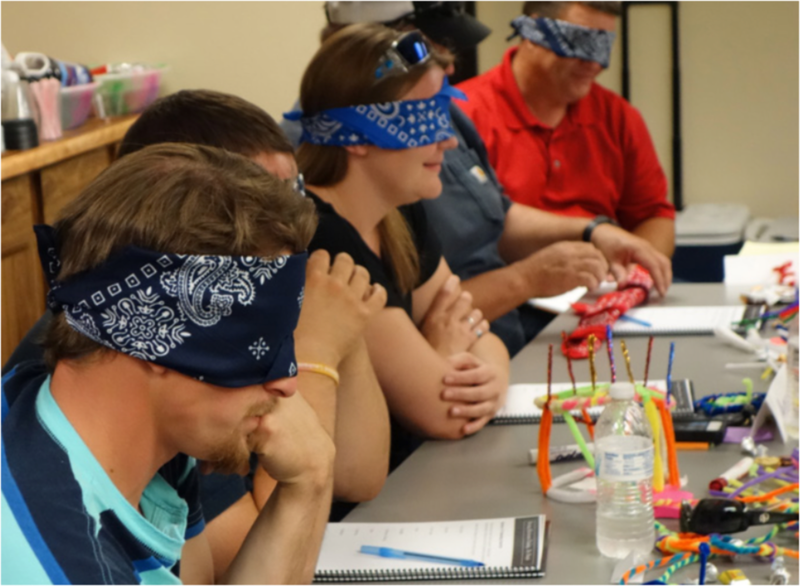 One example of problem based learning we use is a blindfold activity. We blindfold four students and make them “employees” they are told to use help from their not blindfolded supervisors to build interlocking rectangles with two pieces of 16 foot tape. The catch is that the supervisors or non-blindfolded participants only have 150 words to direct their employees with. Supervisors often have limited time to spend directing a specific project. When the blindfolded employees ask lots of questions and are self-directed but use advice from their supervisors’ word usage is most efficient. When supervisors try to micromanage and dictate all the actions of the employees the 150 words are used before much progress is made. In this problem based learning example, supervisors learn that micromanaging is often an inefficient use of time and energy. If your employees only retain the knowledge for as long as the training lasts, or until they are asked to take a test showing they paid attention, you are not getting much bang for your training buck. Train for knowledge retention and you will reduce retraining costs. You will also improve employee skills, maximize employee potential, and minimize rework. At Meyvn we have seen the results of these theories put into practice. 94% of our students give us a 5/5 when asked if they would recommend us to their peers. Their managers are also impressed with what we do, as most of our business comes from repeat customers. 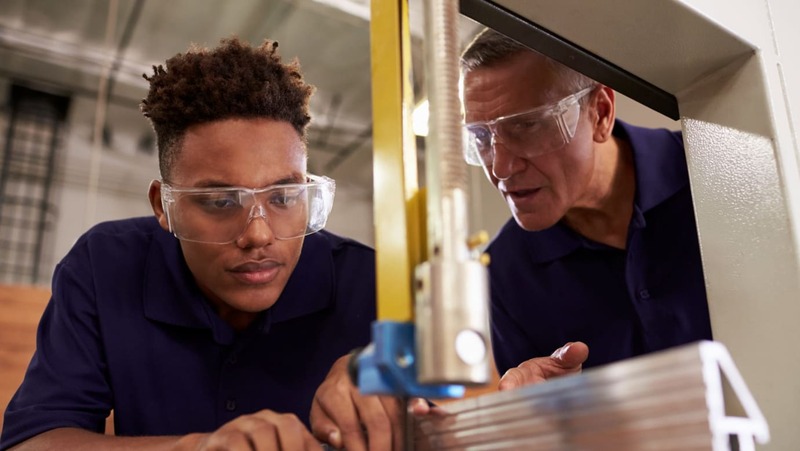 It makes sense that training would have a positive impact on employees—according to the polling firm Opinion Matters, CEO’s believe in training so much that 93% of them expect to either maintain or increase their training budgets next year. According to ASTD U.S. firms spend 2.7% of their staffing budgets on training. Yet in spite of these significant investments peer reviewed scientific articles show that while training does have some positive impact on job performance, the size of the effect isn’t huge. We believe one of the obvious ways to make the training impact a more positive one, is to train for knowledge retention. Meyvn Global (pronounced MAY-ven) is an international training and development firm that is Unlocking Human Potential. We are unlike any training consultants you’ve ever worked with. In Leadership Training and Personnel Development we’ve cultivated a reputation for being fun and engaging. But just between us, the fun factor is only the means to the end; our experiences are known to raise retention rates to 75%. That’s up to 65% more knowledge retention than the alternatives. You know- the ones with the nasty habit of causing drowsiness and boredom.